Modern dobby fabric brings the pillow an ultra soft 500 thread count 100 cotton sateen surface and provides a barrier to the texture of the natural fill. Included are two thick yet plush pillows that are filled 75 white goose down and 25 white goose feather that offers luxurious comfort throughout the night. The 500 thread count cover is easily removable with hidden zipper for easy cleaning. 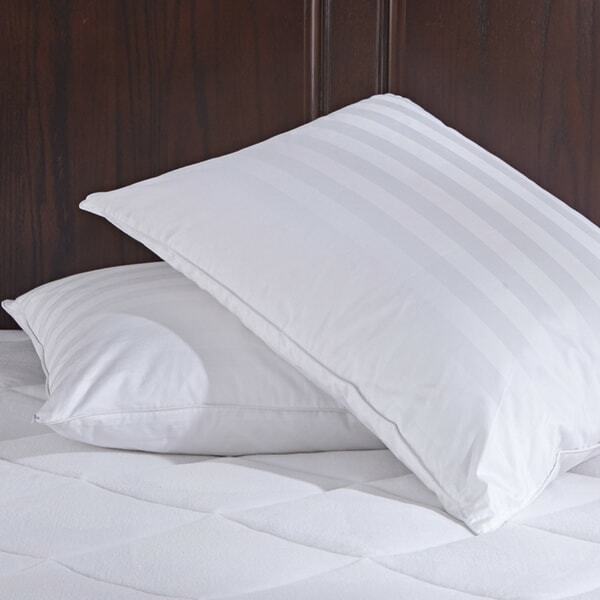 Pillows are made from Removable 500 thread count sateen cotton outer pillow protector with 230 thread count 100 cotton inner shell . Filled with 75 White Goose Down, 25 White Goose Feather. Spot Clean, Dry Clean Recommended. Materials are Responsible Down Standard certified and cleansed by Oxipower technology. Dimensions 36.0 In. X 20.0 In. X 3.0 In. These king size pillows were purchased in order to use some king size shams I’ve been wanting to try on my bed. They are on the soft side of goose down pillows, which is fine by me. Personally, I prefer a softer down pillow & if necessary I can fold these pillows in half for a little more loft. At first I believed I was misled about the zippered cover which comes w/the pillow, but I was completely wrong. The zipper for the pillow cover is so well hidden, I had to look twice to find it. Overall, I consider these pillows a good purchase.